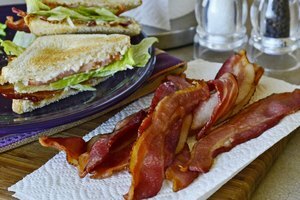 Crisp bacon makes for satisfyingly crunchy bacon bits or sandwich filling, but many people prefer their bacon soft and chewy when eating it with toast and eggs for breakfast or as a snack. 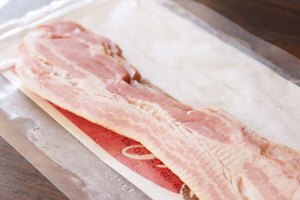 Cooking soft bacon is a bit of an art -- it needs to be pliable enough to feel meaty and lean, but cooked enough that the fat is crisped slightly and the strips are no longer flaccid. Paper-thin slices of bacon are almost impossible to cook to soft perfection. 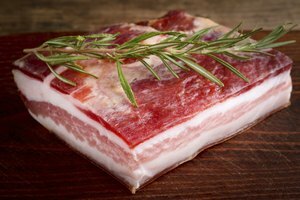 Instead, choose only the highest quality bacon that's cut thick, such as cottage or country styles. Choose bacon that has a noticeable amount of meat, too, in relation to the fat. When you're preparing just a few strips, cook them on top of the stove in a skillet or frying pan. This allows you to keep an eye on the meat the whole time and ensures no overcooking. Choose a heavy skillet that's large enough to fit the strips of bacon laid out without them overlapping or folding. Place the bacon into the skillet and coat it with just enough water to cover the bottom of the pan. 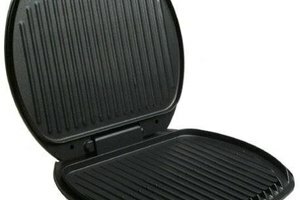 Bring the burner up to medium-high heat. Allow the water to come to a simmer and boil off. This helps render the fat so you get leaner, soft slices. Lower the heat to medium and continue to cook the bacon until it's just chewy and still soft -- about 3 to 5 minutes. If you have large amounts of bacon to cook, baking it in the oven is much more convenient than frying the strips up a few at a time. You don't have as much control as when it's cooked stovetop, so check on it early and often to make sure it cooks to the softness you're seeking. 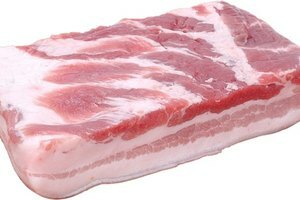 Lay all the strips of bacon on a broiler pan and place it in an oven preheated to 400 F. The bacon can be close together, but shouldn't touch or overlap. Line the pan with foil for easy cleanup. Place in the oven and bake for about 12 minutes. If the bacon is cooked through to your liking, remove it. If you want it a little crisper around the edges, but chewy and soft in the center, continue to cook 3 to 5 minutes longer. If the bacon is becoming submerged in grease as the fat renders, pour off a little of the liquid, and then return the broiler pan to the oven. Remove the bacon from the oven, and use tongs to place the strips on a plate or platter lined with paper towels to catch the excess grease. Serve soon -- the longer it sits, the more it could crisp up.